Take hydration to the next level. Want luscious, hydrated skin that smells amazing? Need The Moisture Hit! Keep your glow game going strong with our deeply hydrating and nourishing products designed for the babe that demands a long lasting tan. Packed full of premium ingredients proven to bring in the moisture and prolong melanin production. Smell like summer all year round! Sun Tan Sealer: Use our Sun Tan Sealer daily to prolong melanin production, and keep your tan game going stronger and longer. Massage into warm damp skin after a shower. Hydrating Body Spray: Spray on face and body anytime! Keep it in your handbag, in your gym bag, at your desk, wherever you want a hit of hydration. Keep in the fridge an extra refreshing & cooling boost. How do these product/s pro-long my melanin production? Our Sun Tan Sealer contains two vital ingredients that prolong melanin production - Lycopene and beta-carotene. This means as you’re intensely hydrating your skin you’re also prolonging your melanin levels which is a win-win! Will this product help me tan? Not as such, they are here to bring a hit of moisture into your skin! However studies suggest that hydrated skin absorbs UV exposure better which makes it easier to tan, so drink your 8 glasses of water a day and use The Moisture Hit! Can I use these on my face? You sure can babe! Our Hydration Body Spray also doubles as a make up setting spray! When do I apply these product/s? Our hydration range can be used anytime! The fox tan is my hero!! 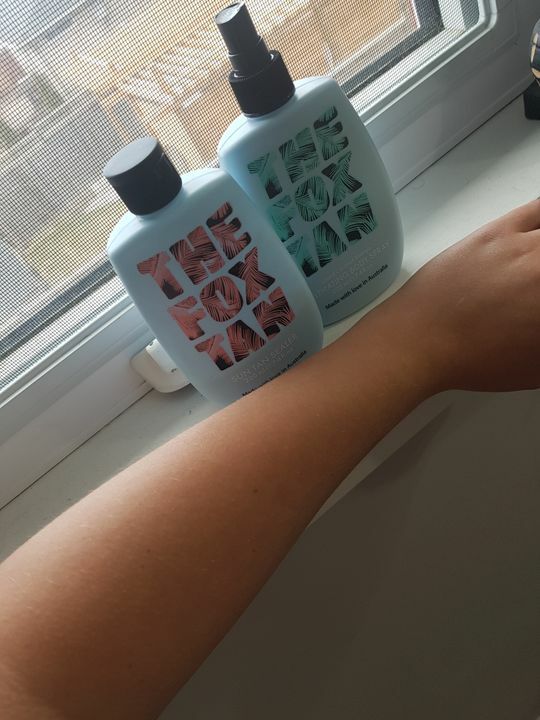 After a long winter in canada i decided to hit the tanning bed with fox tan and I'm loving it so far, purchased this along with the originals and I couldn't be happier with the results. My new favorite!! Keeps my tan and really makes my skin glow! Would love to get the rapid mist next to get me nice and brown by summer! Leaves my skin feeling smooth & really hydrated! I bought the rapid tanning mist and I have never had a better tan, in the sun and on the sunbed. The moisturiser also makes your tan deeper. I would highly recommend this product.